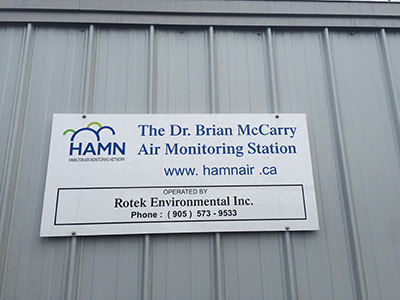 We installed a new air monitoring station on the Beach Strip in HAMN and dedicated it to the late Dr Brian McCarry. Air Quality data from two additional air monitoring stations is now available from the HAMN website. Station 29181 and 29182 owned and operated by the City of Hamilton were activated on November 1st, 2014. Station 29168 St Christopher Park should be back online by mid to late July, 2014. Station 29154 has been terminated. This station was operated by the Ministry of the Environment. Historical data is still available on the HAMN site. Data from station 29147 is now available on the HAMN website. 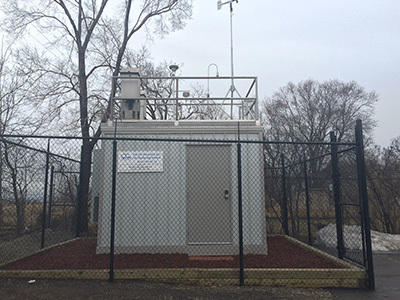 Newalta Stoney Creek Landfill is providing continuous Inhalable particulates (PM10) data, Wind Speed (WS), Wind Direction (WD) Temperature (T), Relative Humidity (RH) and rain measurements. As of August 29, 2013, station 29113 has been shutdown and has been relocated. A new station number(29180) has been assigned to this new location. Station 29153 has been temporarily shut down for roof repair. The two remaining particulate monitors (PM10) have now been commissioned and are operating as part of the Hamilton Air Monitoring network (HAMN). Data from station 29153 and 29154 can be accessed via the network's interactive map. This last phase of the particulate monitoring enhancement project brings the total number of real-time particulate monitors to 8. This $200,000 project was jointly funded by the Ministry of the Environment and HAMN. In continuing to better assess air quality in Hamilton, two additional real-time particulate monitors (PM10) have been added to the Hamilton Air Monitoring Network(HAMN). Data from station 29113 and station 29170 can be accessed via network's interactive map. HAMN is expected to have two more particulate samplers come on line by the end of the year. The Ministry of the Environment has provided funds for these additional samplers. Effective June 2, 2009, the Hamilton Air Monitoring Network (HAMN) website was launched. In phase one of this release all real-time continuous hourly data will be made available. An additional three more monitoring stations will be added to the network this summer. Network changes will be posted on this website. In phase two of this program, all non-continuous monitoring data will be made available on this website. Non-continuous monitoring data require laboratory analysis. Reports are prepared quarterly and submitted to Ministry of Environment.